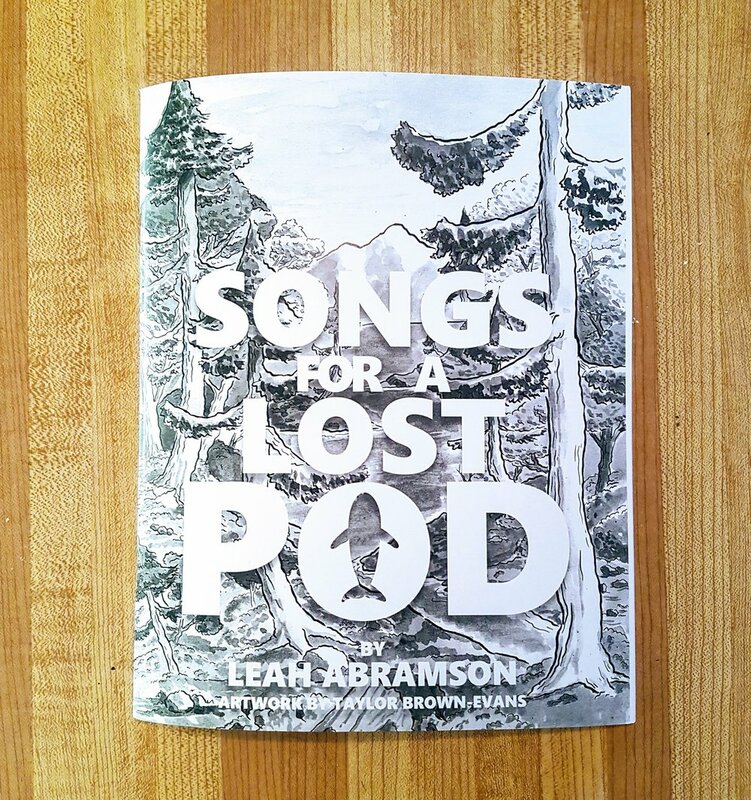 Vancouver singer-songwriter Leah Abramson (The Abramson Singers) releases her fourth album, Songs For a Lost Pod on November 3, 2017 on Headless Owl Records. The first single Pilot Protest is a collaboration with J.J. Ipsen (Hayden, Jim Guthrie) and is about Pilot whales beaching themselves on purpose to protest humanity. Originally written and composed for her Masters of Fine Arts thesis at UBC, Songs For a Lost Pod is a concept album combining scientific research, whale sounds processed into beats, and marine mammal history. In collaboration with musician-producers, field recordings and orca whale vocalizations were processed into beats and tracks, barely recognizable as original sounds, but providing an intangible continuity to the album. Musician-producer collaborators include Sandro Perri (Polmo Polpo, Devon Sproule, Tasseomancy), Aidan O’Rourke (Lau), J.J. Ipsen (Hayden, Jim Guthrie), Andrew Lee (Holy Hum, In Medias Res), Antoine Bédard (Montag), and more. Also, this is the first ever Headless Owl release to not be released as a record! Available as a graphic novel!! Want a copy for your very own? Find it here! Did you miss us? We certainly missed all of you. It's been awhile. Too long, one might say. And for that, we apologize. It's been a busy year. We moved out office to Toronto. Some personal reasons brought us back across the country to the Yukon. We watched two different new Star Wars movies. It's been a busy time for all of us. But now we're back, and now we have news for you. And here it is. Way back when, in 2014, we were lucky enough to work with one Jon Mckiel. We put out a record, it was a self titled EP, and it was one of those record that left all of us wanting more. MORE! The people demanded. Holy smokes. Right?! Now, here's the second bit of good news. Conduit is the first single from the new Jon Mckiel record. It's called Memorial Ten Count, and it's going to be available on March 10, 2017. Crazy soon! We're lucky enough to be working with our pals at You've Changed Records on this release, and naturally we've printed a small run of these beauties to a nice, 180 gram, heavyweight, black vinyl. Want to nab one of your very own? You can pre-order by clicking right here. So yeah, isn't that a bit of news to start the year out right? A new Jon Mckiel for a new year. A new you, a new us. Peace sign to America, a system of love. Well, there was times when we thought 'maybe we dreamed this was hapenning'. There were days when we worried we would never get to write this post. And yet, all those sleepless nights, all those worries, well they were for naught. Today, our best beloveds, is release day for Speak & Spell U.S, from By Divine Right. What is Speak & Spell U.S? It's a song for song cover of the album by Depeché Mode, replacing all the glorious 80s synth you know and love with the monster riffs of BDR. It's the only Depeché Mode record to feature founding member Vince Clarke. It's the only BDR record to feature a taxidermy beaver holding a donut on the cover. Want a copy for your very own? Of course you do. Look no further than right HERE . Looks great on a turntable, sounds great at parties, feels good at home. Don't delay, act today! Alright, play safe out there dudes and dudettes. You're the best. Those stalwart sons and daughter of Canadian music The Burning Hell have graced us once again with some new tunes. In the form of not one, nay two but THREE new pieces of waxy musical goodness! Tell me more you say? You got it! Moving on from there, a stopgap, if you will, between this and the upcoming new Full Length long player, is a fun little 7" single, containing the song "Men Without Hats", off the forthcoming Public Library. It's a song about, and you'll never believe this, Men Without Hats. It's pretty great. On the B side? Pop Goes The World. By Men Without Hats. It all comes full circle. Which brings us to the final piece of resistance, Public Library! The new album from The Burning Hell! A hodgepodge of the best lyrics, musicianship and all around good vibes you'll ever come across! Coming very soon to a turntable near you! Speaking of, if you've made it this far, you may be asking yourself where you can grab copies of thee beauties? Look no further than HERE! You can grab them one by one OR for the thrifty true believer, we also have a mega pack with all 3 albums for one low price and FREE shipping. Crazy, right? So crazy it just might work!